Grampa's Gourmet Ol' School Survivor bees are a lot smarter than other bees we've kept. They fly out of the hive in a much more decided way. They know exactly where they're going and they waste not a microsecond in getting there. Sorties shoot out of the hive low and fast. There's little time for anyone to react if you're in their flight path. They know how to drink out of the bird bath without drowning. They've even figured out how to walk down the sedum at the edge of the plastic pond for a safe drink. But they're also a bit more aggressive, sometimes harassing us a good 15-20 feet away from the hive. It might be just one bee, but chances are she'll go for your head. My recent sting wasn't bad at all, but apparently I've been traumatized by having four bees stuck in my hair. The sound of a loud buzz anywhere near my head will put me in double-time mode, which is not conducive to slow graceful moves. Oh BTW, our new addition, the Warré Hive, is finally here and ready to receive the swarm bees. We'll start with them... Watch for a tweet about their hiving. After we caught the swarm, I referenced every beekeeping book we own and, while many books give instructions on how to retrieve a swarm, there is little information on what to do with it after you have it in a box. I guess the assumption is that you proceed as if working with package bees, since they too are loose bees with a queen, but that doesn't work for me. For one, packages are 3- or 4-lbs of bees, while swarms are many different sizes. I doubt that our swarm weighed even one pound. Package queens are guaranteed mated and laying, but a swarm might have a seasoned queen or might have a virgin queen. Second, we didn't even have a hive for them! I mail ordered it after they entered the bait box. 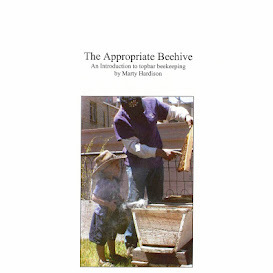 At any rate, I did find some useful information in a book titled "Beekeeping: A Seasonal Guide" by Ron Brown. The book is a bit too advanced for me, actually, so I can't give it a proper review yet. Right now, I can only say it's a good one to have on your shelves.